The first salvos in the battle for workers’ pensions have been fired, and the war could be coming to the U.S. Congress this month. Detroit is trying to saddle the city’s bankruptcy on the backs of its 21,000 retirees by slashing their pensions. The Mayor of Chicago, where the costs of public pensions are merely an inconvenience, also has the city workers’ hard-earned retirement funds in his crosshairs. Even the International Brotherhood of Teamsters’ (IBT) Central States Pension Fund is looking to make across-the-board cuts. And it could be getting worse. Congress is about to introduce a bill that would allow “deeply troubled” pension funds to cut benefits for people who have already retired, something that is now illegal. It would give the green light to Corporate America and others to further slash retirees’ payouts and reduce already-earned credits for current workers. This all comes at a time when more than approximately half of American workers have less than $2,000 saved for retirement. Thirty-five percent of Americans over the age of 65 rely almost entirely on Social Security payments alone. Only 20 percent of American full-time employees have a defined benefit pension plan. The Machinists Union, and the IAM National Pension Fund that manages nearly $10 billion in assets, is making it clear that we are on the side of working Americans. 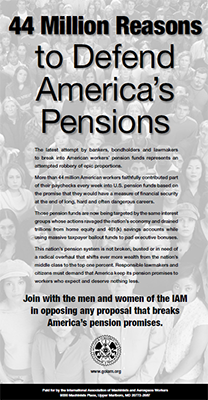 In a full-page ad that ran in USA Today from Friday, August 30, 2013 to Labor Day, Monday, September 2, 2013, the IAM cited “44 million reasons” to defend America’s pensions. To see a copy, click here.